Would you like to make this year a special one he or she will not forget with a uniquely funny Zombie Plant Gift that he or she will simply love to bits? If so, the Zombie Plant Grow Kit is the perfect gift!! Unlike the boring venus flytrap that takes days to re-open, this plant will reopen its leaves in minutes. It instantly "PLAYS DEAD" when touched or stimulated it in some way. Perfect for a gardening enthusiast who has an appreciation for unusual plants. Its unique features and behavior make it an ideal gift. The Zombie Plant Kit contains 6 soil pellets packed in a black coffin-like container, which perfectly suits the "zombie theme". Also included are zombie plant seeds (Mimosa pudica), making it a complete DIY gardening pack. The Zombie Plant grow indoors and it does not need much maintenance after watering. Adds some interactivity and fun to everyday gardening activities. It is a natural plant with naturally fun behavioral traits. It even produces brain-like flowers! Wouldn't you want to surprise A Friend or loved one with a perfectly unique Zombie Gift that they cherish and take care of? This is the gift for anyone that likes plants zombies or Gardening! Click "ADD TO CART" now to send a gift that'll live on, just as your love for him or her! SEE VIDEO ON THE LEFT OF THE ZOMBIE PLANT THAT "Plays DEAD" When You Touch it! Then Grow Your Own! UNIQUE & FUN INTERACTIVE ZOMBIE THEMED GIFT; This Christmas give someone special a whole bunch of chuckles and fun whenever they nudge this house plant which responds by "PLAYING DEAD" ; only to come back to life shortly afterwards. It is a really funny plant that imitates a zombie. FOR ANYONE THAT LOVES PLANTS AND OR ZOMBIES! Grows indoors Year round. 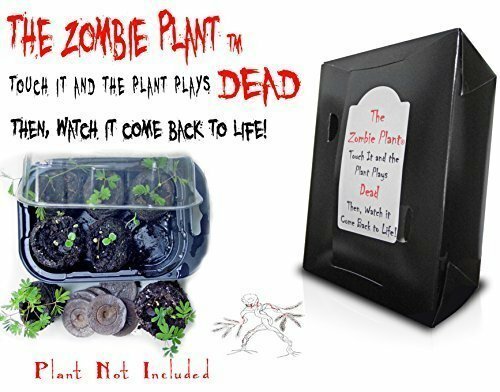 GREAT GARDENING GIFT FOR ALL AGES, Birthday Party or any occasion DIY ZOMBIE GIFT KIT; No tools required The indoor plant grow kit has everything needed to raise an "army of zombies" around the house and share the fun with friends.